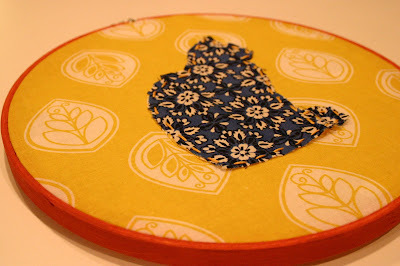 This little mini-project was inspired by all of the embroidery hoops I've been seeing in the blogosphere (which are so adorable), and silhouette diy projects, which are everywhere. So I thought, why not combine the two concepts? This is Red. He's our cat. We also call him "Rhetoric" and "Bread." Jonny took this photo above (which I also used for the silhouette in the blog banner, incidentally). To make the silhouette part, I printed this photo out in black-and-white on regular printer paper. Then I centered Red's profile on a copy machine and copied it at 220%. 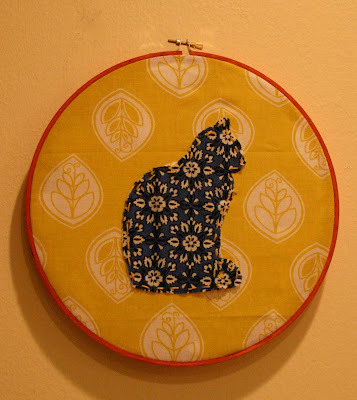 I made sure he would be big enough in the center of the hoop before cutting out the fabric. Then, I pinned his [paper] profile to the blue fabric and cut 'eem out with fabric scissors. 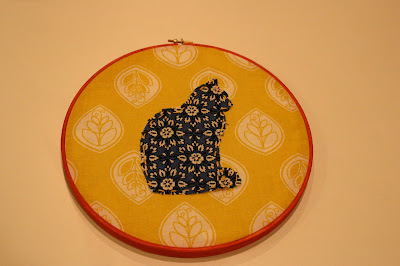 For the embroidery hoop, I bought a plain wooden one at Jo Ann and some craft paint in burnt orange, and just painted it with one of those spongey brushes. Next, I measured the yellow fabric and stretched it out under the hoop to make sure it would cover the hoop's surface area. Then, I/we (Martha helped) used embroidery thread to sew Red's cloth profile onto the yellow fabric. After centering him in the middle of the hoop, we tightened the top of the hoop thingy and voila! This project probably cost around $7, if I had to estimate? 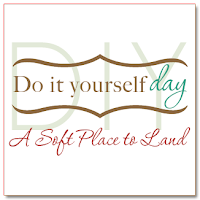 Just a little fun somethin-somethin for your pet or your face (you could do anyone/anything!). So adorable... I'm going to have to try this. My MIL and my daughter are absolute CAT LOVERS!! We have a cat and my 5 year old daughter has him sleep with her every night and he walks with us to the bus stop in the morning. Did I mention that our cat thinks he's really a dog, LOL! Anyway, thanks for the great project idea, I LOVE it! What a cute idea! I love making things that you see other places. My friends in Knoxville have "Craft Day." I'm thinking you and I can continue this in Memphis. Love it! I have a black cat, Millie, so this is just beyond adorable.